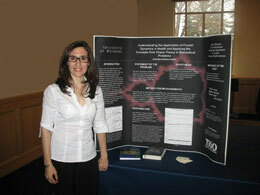 University of Wyoming McNair Scholar Aylin Marquez presented her research at the recent Heartland Research Conference. A University of Wyoming McNair scholar was selected to present her research during a conference in Kansas City, Mo. Aylin Marquez of Samsun, Turkey, a senior in mathematics, discussed "Self-Similarity in the Heartbeat Time Series of Healthy Cardiac Systems in Mice" during the recent Heartland Research Conference. Her work was directed by Eric Moorhouse and Michael Stoellinger from the Department of Mathematics, and Jun Ren and Subat Tuerdi from the College of Health Sciences. Aylin plans to obtain a Ph.D. in mathematics. The Heartland Research Conference offers undergraduates an opportunity to present their research in a formal academic setting, explore opportunities for graduate study and meet other scholars from around the country. The McNair Scholars Program, funded through the United States Department of Education, helps prepare promising undergraduate students to pursue doctoral degrees. It targets first-generation college, limited-income, and ethnic minority students. For more information, call the McNair Scholars program office at (307) 766-6189, TTY-(307) 766-3073, e-mail mcnair@uwyo.edu or visit the Web site at www.uwyo.edu/SEO/mcnair.